This was purchased this year to mail to a friend. I just found it buried under some other things last night. I will see my friend, in Ohio, tomorrow so will take it and give it to her. This is a different style of card. There is a purple checked flap at the bottom that lets the card sit up easel style. The inside is all purple with purple stars like there are on the front. 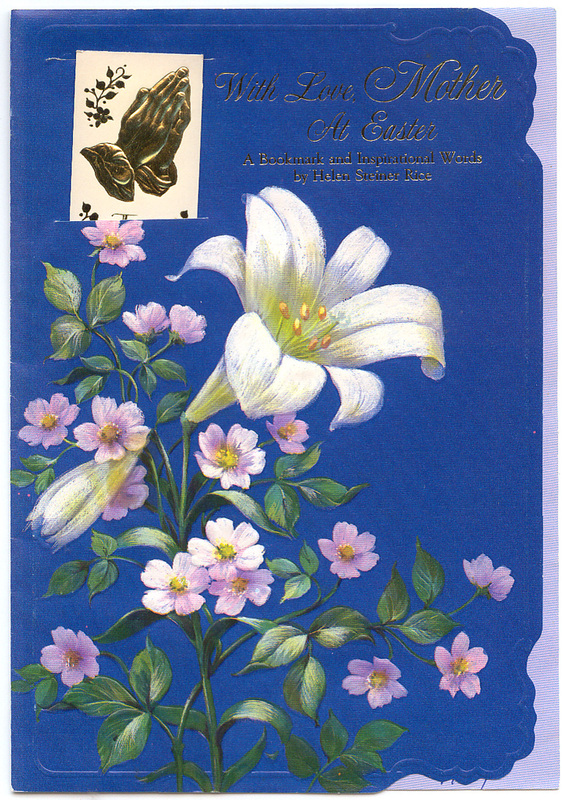 There is gold glitter on the flowers except for the one purple one laying on the right side of the card and the vase, also the stars are drawn with gold glitter, and the little green item (not sure what it is called) has glitter on it. It is from Natures Sketchbook by Marjolein Bastin and was published by Hallmark, card number E 259-7 03-15. I posted another card by this artist not too long ago, April 18th, 2010 to be exact. This is not the card I had scanned for today, but I was picking up the living room, putting things away and I found this card. Guess I really did not look close at it when I received it. All of a sudden while looking at it, it dawned on me the basket was a house. This is not an old card, I received it this year from my daughter Helen and her family, but I am amazed at the imagination that some people have. Easter Eggs make the roof. I just had to share this card. 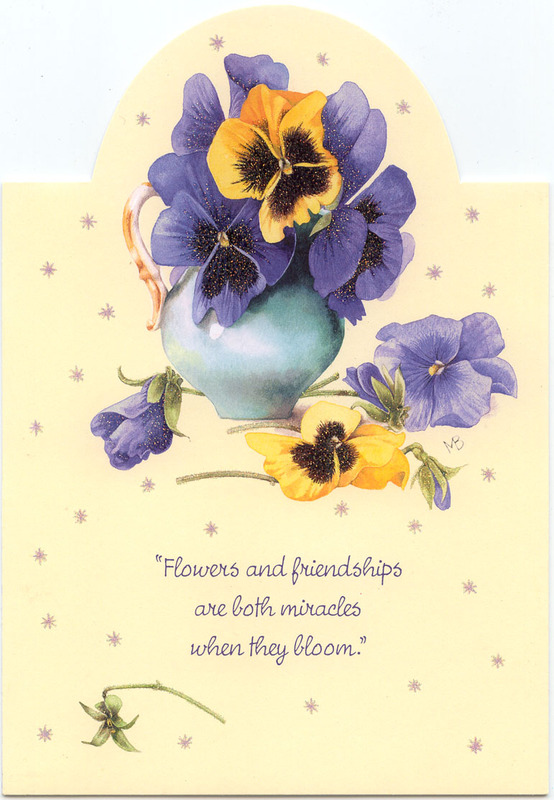 This is a “Tender Thoughts” card from Tender Thoughts Greetings of Mississauga, Ontario Canada number 2.30 TEE02170-07X. Made in the USA. 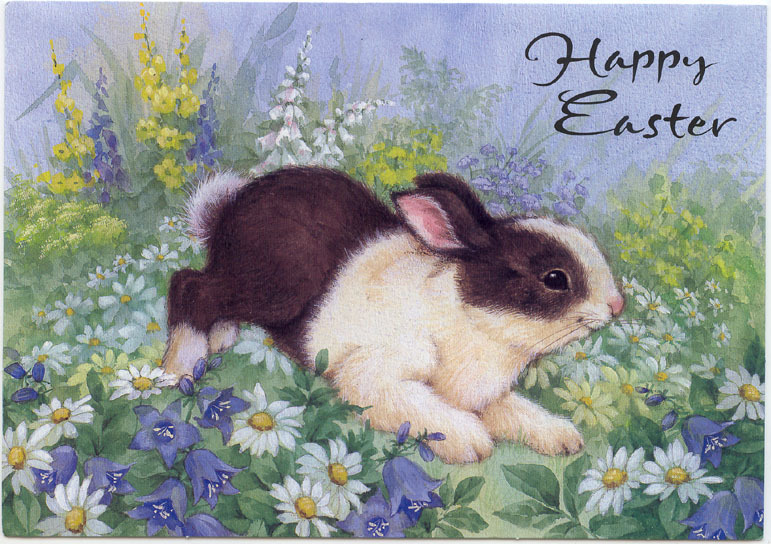 I know Easter is over with, but so many people liked the bunny and animal cards that I just had to post this sweetie. This is a Moorehead Inc card number 150 E2 23048 and was sent to Korey by Marilyn back in 1997. 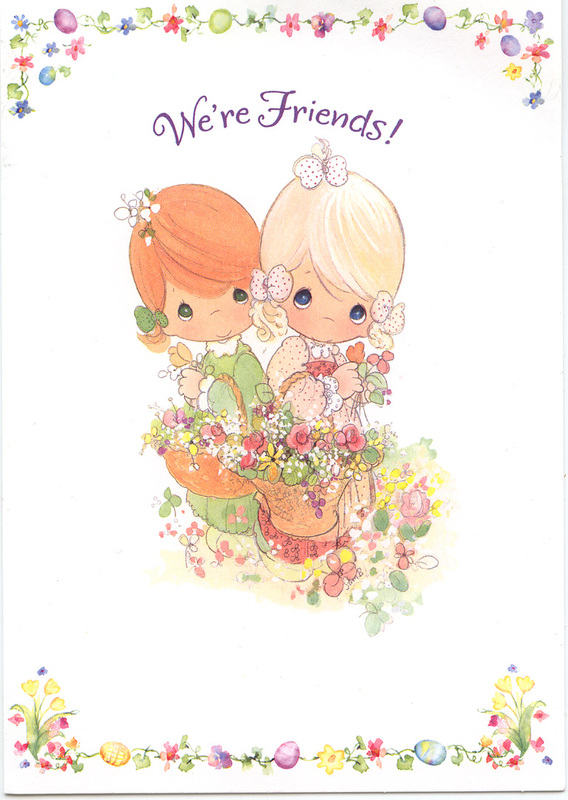 This is a “Precious Moments” card done by Sam Butcher. 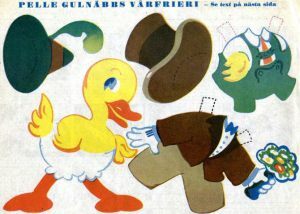 If I had not been collecting paper dolls and dolls, I could have easily gotten hooked on buying his adorable little figurines. 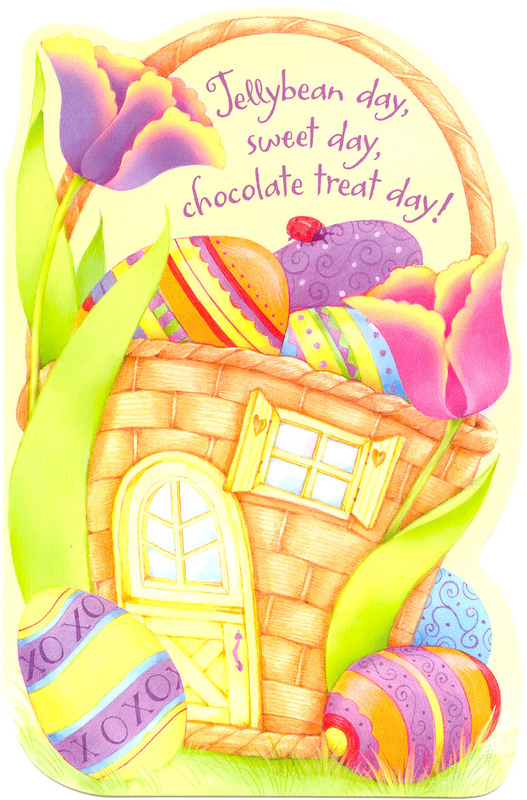 This is a very spring like card with the lovely colors. 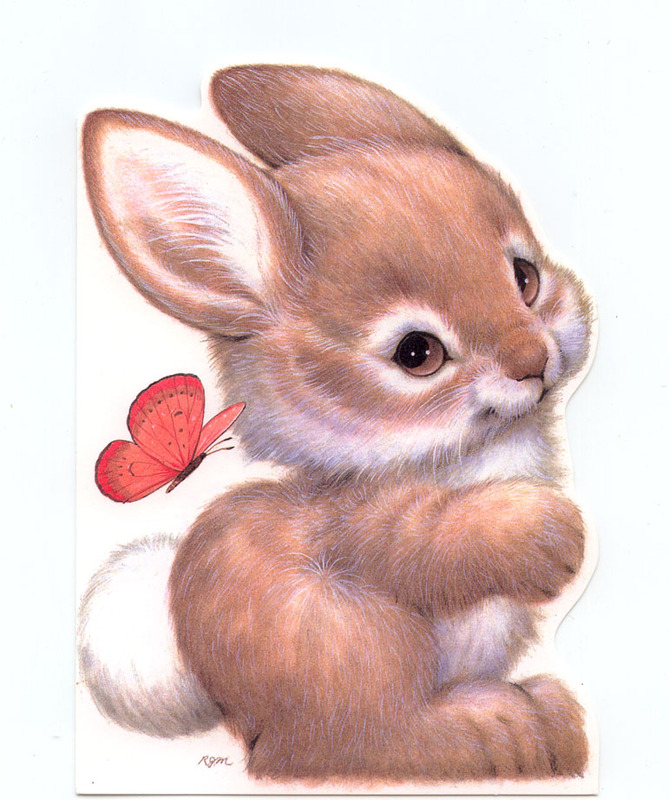 This is such a realistic rabbit and the background is lovely. 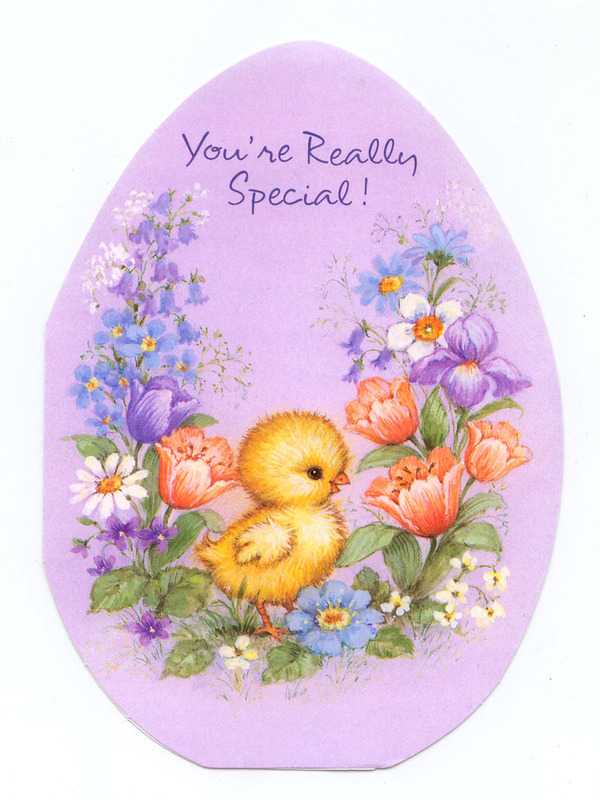 This is a sweet and pretty card, I love the lavender background, the flowers are so spring like (wish we would get some spring down in Fort Lauderdale, Fla.), and the little duck is so sweet. This was sent to me from Marilyn back in 1997. 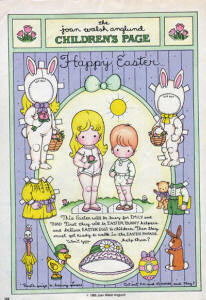 It is a “Celebrations by Gibson” card number 135E21237 from the Gibson Greetings Inc.